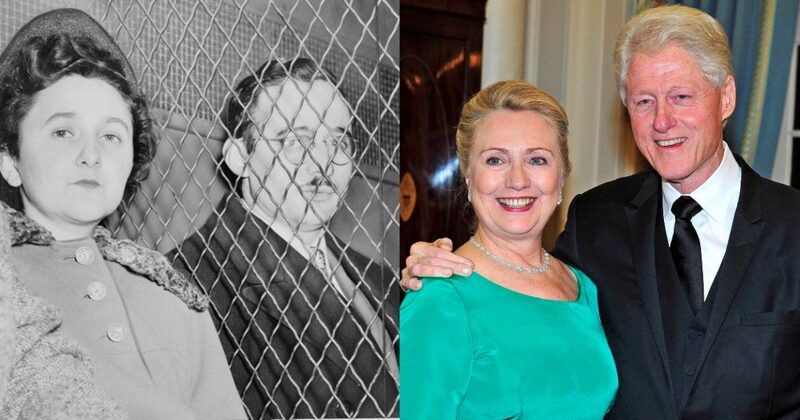 What is the difference between the Rosenbergs, executed for espionage, and the Clintons? Very little. Photo, above: Left – Ethel and Julius Rosenberg, executed for espionage in 1953 for selling America’s nuclear secrets to the Soviet Union. Right – Hillary and Bill Clinton, who apparently engineered a conspiracy to give Russia control of 20% of America’s uranium reserves. Gorka spoke during an interview with Fox commentator Sean Hannity on his show Hannity. The two discussed Secretary of State Clinton’s involvement in the 2009 U.S. decision to allow the sale of Uranium One, a Canadian mining firm with licenses to mine American uranium deposits in Kazakhstan, reports The American Thinker. Gorka was referring to Julius and Ethel Rosenberg, who were executed by electric chair in June 1953 after they were accused of giving top-secret nuclear weapon designs to the Soviet Union. The Nuclear Regulatory Commission wrote to Mr. Barrasso assuring him that American uranium would be preserved for domestic use, regardless of who owned it. In Wyoming, where Uranium One equipment is scattered across his 35,000-acre ranch, John Christensen is frustrated that repeated changes in corporate ownership over the years led to French, South African, Canadian and, finally, Russian control over mining rights on his property. We in fact may have no idea how much yellowcake was exported illegally to foreign buyers and who these buyers were. They could have been representatives of rogue regimes like North Korea and Iran. Neither they nor Russia is very much interested these days in the peaceful uses of nuclear power. They are interested in building nuclear bombs and putting them on missiles pointed at the United States. Hillary Clinton’s former running mate, Sen. Tim Kaine, said Donald Trump Jr. may have committed treason when he agreed to meet with a Russian lawyer under the pretense of getting dirt on Clinton. “That, the investigation — it, it’s not — nothing is proven yet. But, we’re now beyond obstruction of justice in terms of what’s being investigated,” the Virginia Democrat told CNN Tuesday. “This is moving into perjury, false statements and even potentially treason. On Monday, Hillary Clinton’s former campaign manager, Robby Mook, demanded Trump’s campaign aides be “prosecuted for treason” if evidence emerges of coordination with Moscow during the recent presidential campaign.